After having oxtail at Avec a couple months ago, we were intrigued enough to try some more at home. 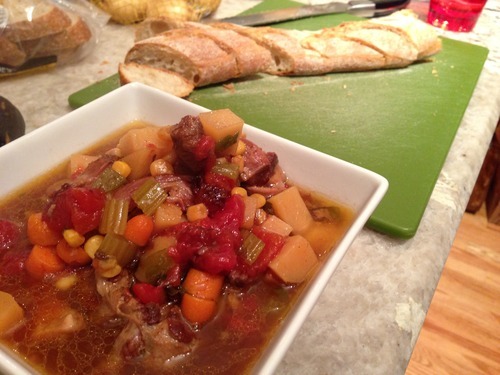 After throwing around the idea, we decided on an oxtail stew, and came across a blog from crockpot365. 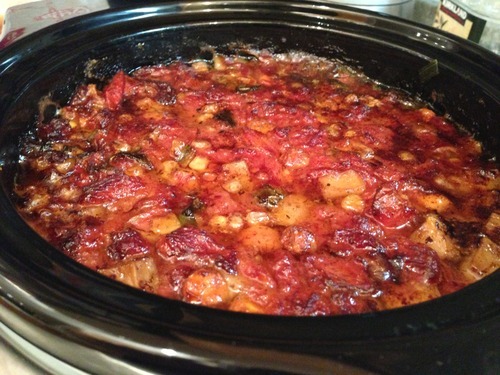 After making it once in our slow cooker and deciding it was tasty, we’ve kept it in the back of our heads to try it again. 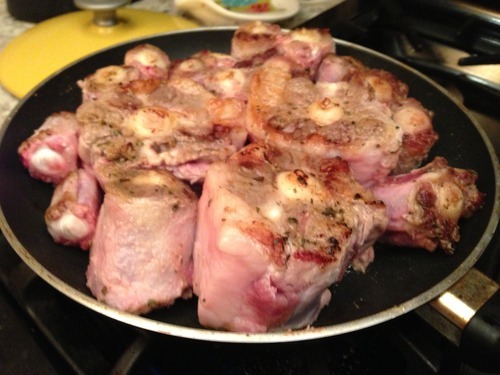 The first time we attempted the recipe, we were overwhelmed by the recipe asking for 3 lbs of oxtail (which was 6 large pieces). 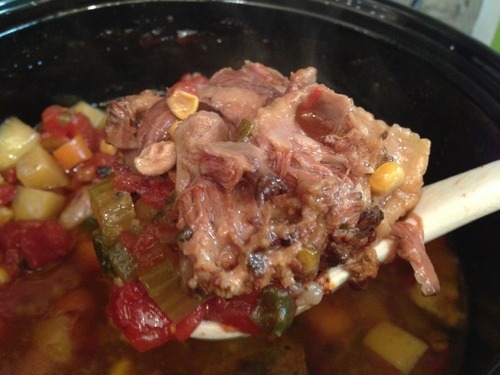 We ended up grabbing 1-1.5 lbs, and after cooking decided it wasn’t nearly enough as we had to be really conservative about how much oxtail we ate in each bite of the stew. This time we went all out with 3 lbs. Also, for some reason I ended up cutting the potatoes really small last time, so I made a conscious effort to leave nice sized chunks this time. We both got home late the night we decided to get the stew started for the following evening’s dinner (considering we basically let it cook on low for 22 hours). We made a few changes from the linked recipe. 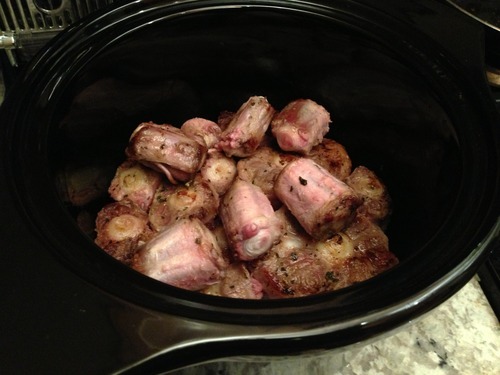 Based on some other blogs, we decided to sear the oxtail in a pan prior to putting it in the slow cooker. 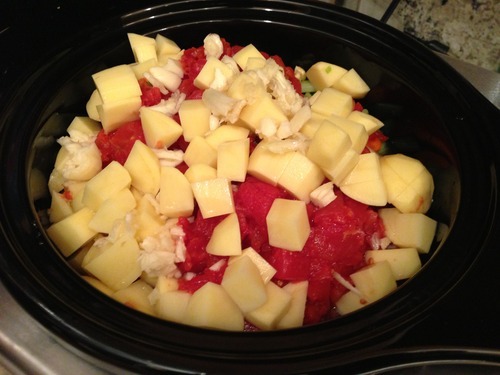 We read that some people prefer to do this in lieu of putting completely raw meat into the slow cooker. Additionally, the first time we made the stew we added in the chocolate square, but it didn’t seem to add anything special so we left it out this time. 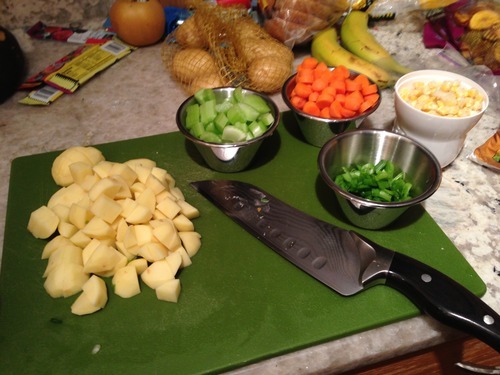 Unfortunately, we got a plantain to experiment with as well, but forgot about it. Perhaps next time. Overall, this meal was memorably better than out first attempt. We definitely got what we wanted in terms of oxtail in every bite. Without further ado, here are a couple of pictures (including a Trader Joe’s ficelle that only costs a dollar). The first picture is right after taking off the lid, with that nice layer of fat coating the top.